1986 Post graduate from Visva Bharati University Kala Bhavan Shaniketan, with 1st division in Painting. 1982 Graduate from Govt. College of Art & Craft, Calcutta with 1st division(Painting). 1982-96 Merit scholarships from Visva Bharati University Kala Bhavan Shantiniketan, with 1st division. 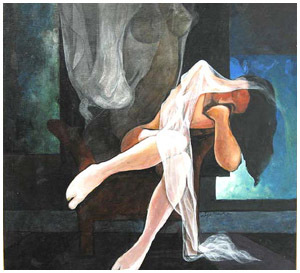 1982 Governors Award for Painting (West Bengal). 1982 Silver medal for Best Painting from Indian Society of Oriental Art Calcutta. 1981 Certificate of merit for Painting from Govt. College of Art & Craft Calcutta. 2000 Bajaj Art Gallery, Mumbai. 1995 Shridharni Art Gallery, New Delhi. 1995 Birla academy of Art & Culture, Calcutta. 1993 Taj Art Gallery, Mumbai. 1983 AIFACS Gallery New Delhi. 1982 Academy of Fine Arts. 2000 Art Today New Delhi. 1999 Art Forum, New Delhi. 1998 Krishnaswamy Foundation Hall, New Delhi. 1998 Dhoomimal Art Gallery, New Delhi. 1997 Lalit Kala Academy, Lucknow. 1995 AIFACS, New Delhi1991-94 Kala Math, New Delhi. 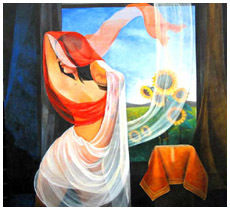 1992-95 Avantika, Arcee Art Gallery, New Delhi. 1980-82 Academy of Fine Arts. 1999 Pub.Cover of Reader Digest. Office of the Chief of Air Staff N.D.
Birla Academy of Art & Craft Culture; Calcutta. Indian Society of Oriental Art, Calcutta. Subarban Engineering Works Calcutta, and many other private collections in India and abroad. 1980-82 G.C.A.C annual exhibition Calcutta. 1978-82 Indian Society of Oriental Art Calcutta. 1979-82 Academy of Fine Art & Culture, Calcutta. 1986-89 Annual All India Art Exhibition, New Delhi.